Slumber Buddies Projection & Melodies Soother Just $4.88! Down From $25! You are here: Home / Great Deals / Christmas Deals / Slumber Buddies Projection & Melodies Soother Just $4.88! Down From $25! Amazon has this Slumber Buddies Projection & Melodies Soother on sale for $4.88 (Reg. $25)! Please keep in mind that his toy is an Add-on so you must check out with at least $25 in your cart! Slumber Buddies are the perfect companions to help ease your little one to sleep at night. Great for children of all ages, this soft, plush toy projects a calming starry sky display on walls and ceiling and plays a peaceful selection of sounds to help relax and soothe baby to sleep. 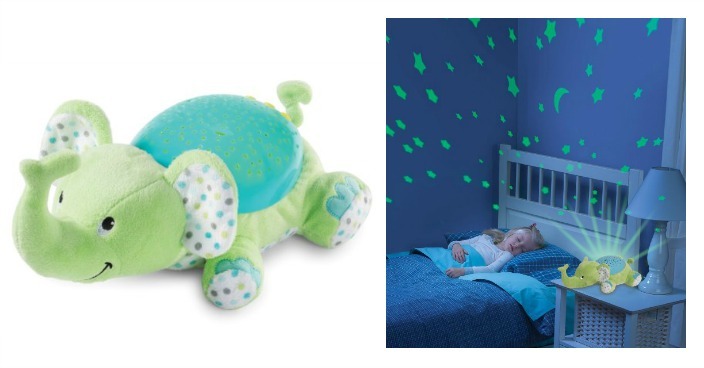 Let Slumber Buddies soothe baby to sleep or help older children overcome their fear of the dark! Children will love this plush buddy, and parents will love a little extra peace at bedtime..